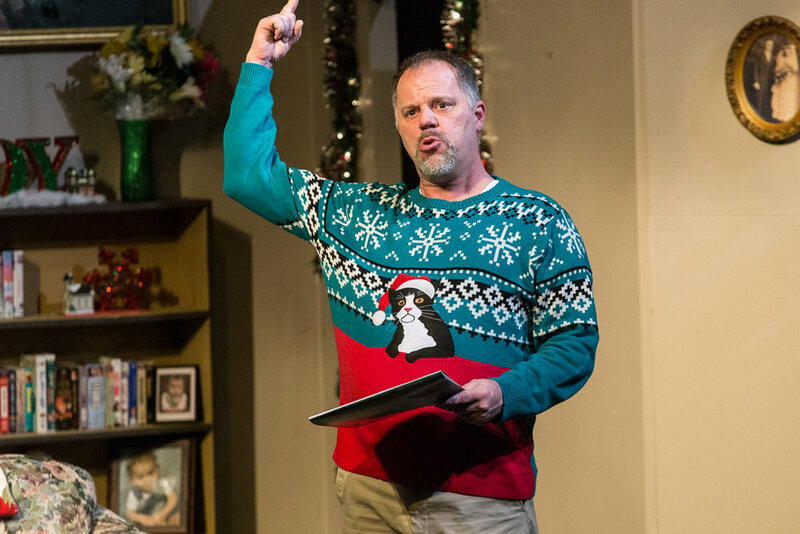 Waukesha Civic Theatre’s “Candy Cane Tales and Holiday Carols” is like a holiday buffet of well-known stories and songs of the season, plus a bonus of a charming story throughout. The show, directed by John Cramer and Kelly Goeller, which has been a staple at WCT for many years (excepting the previous two), has a brand- new story weaving through it with a strong message and well-done performances. Many of the songs and stories have returned from previous years, but the show seems decidedly fresh. The book is by Cramer, with script and score consultation provided by Doug Jarecki, Goeller and Josh Parman. Throughout the show, we see scenes in which Bill attempts to get his family into a similar Christmas spirit as his, with varying results. We see him making out his Christmas calendar with family events like Game Night, Movie Night, Caroling, etc. Augie, with a typical teen-aged attitude, is indifferent to “Daddy-O.” But throughout the show, we see how Dad’s warming to the holidays melts Augie’s – and others -- cold attitudes. Of course, songs happen, some organically, others not so much. Bill’s singing of “It’s Beginning to Look a Lot Like Christmas” fits in nicely as he surveys his home’s decorations. When Louisa’s high school boyfriend, Derek, stops by to try out a number – “Run, Run Reindeer” -- he’s been rehearsing on Louisa and her friends, the girls all take off in an energetic romp around the living room. There are tales that creep in between scenes, such as the famous episode in “A Christmas Story” in which Flick’s tongue gets stuck on the flag pole. Other well-known stories include “A Visit from St. Nicholas” (“‘Twas the Night Before Christmas”) and a scene from “How the Grinch Stole Christmas,” with the tune “You’re a Mean One, Mr. Grinch,” all nicely done. The performances in the Bickford Family (Mike Owens, Jen Hull Anderson, Cecilia Fleischer, Tristian Harris, Emily McCaskey, Violette Anderson) story are quite good. As Bill, Owens takes charge with a big, likeable personality. His Bill is a little blustery and a littler flustery at times, always keeping his eye on the prize: Christmas Day. He engages nicely with his kids, who all seem more tech savvy than he is. He and Anderson’s Judy are a comfortable pairing throughout. I especially liked “I’ve Got My Love to Keep Me Warm” with the pair swaying in a graceful dance as they sing the familiar tune. Ellen Arndt leads a group of snappy, glittery gold-attired dancers in “Perfect Christmas Night” with fine vocals, and returns in Act 2 for a heartfelt “Christmas Eve,” hitting subtle emotional points in the pretty song about the importance of family traditions. Ceci Scalish adds lots of effective vocal flourishes and energy, plus a boffo ending to “All I Want for Christmas,” accompanied by the golden dancing girls. The carolers (Dave Jirik, Owens, Jen Hull Anderson, Matt Knudson, Elizabeth Bagley and John Skatrud) sing a trio of holiday tunes with some pleasant, full harmonies. Would have liked to have heard even more! Jirik and Knudson provided fun characterizations of the Winter Warlock and Frosty respective, engaging the kids well. Derek Castor’s set of the Bickford home folded in on itself on two sides, allowing for quick and quiet scene changes. An eclectic mix of holiday tunes played between scenes ranged from melodic classics to contemporary versions, some of which were not particularly melodious. Nonetheless, this is a joy-filled production emphasizing family, tradition and giving – all that should be in abundance this time of year.